A 71-year-old woman with a history of hypertension, hyperlipidemia, and atrial fibrillation presented to the emergency department with acute, severe left flank and pelvic pain, nausea, and emesis. She denied hematuria, dysuria, and NSAID use. Vital signs were normal. She had pain with abdominal palpation. Urinalysis demonstrated 1+ leukocytes, 2+ blood, and no casts or infection. Creatinine was elevated from 1.1 to 3.17 mg/dL. 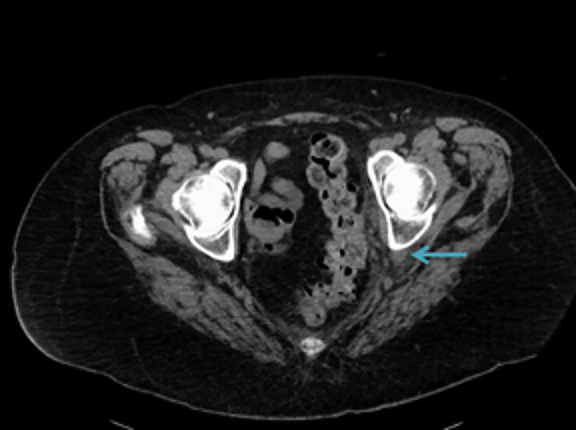 Noncontrast CT abdomen and pelvis confirmed the etiology of her pain. One year prior to this admission, she had a similar presentation and was diagnosed with ureteral obstruction causing unilateral hydroureteronephrosis. She was treated conservatively as her symptoms resolved without intervention. 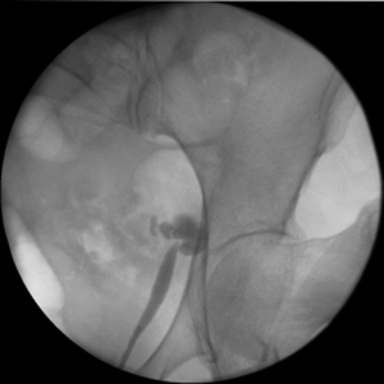 On this recent admission, urology recommended cystoscopy and ureteral stenting. Retrograde pyelography demonstrated a tortuous left ureter near the sacroiliac joint. Purulent fluid was drained with guidewire insertion, and a double-J stent was placed. The creatinine declined postoperatively, and her pain resolved. 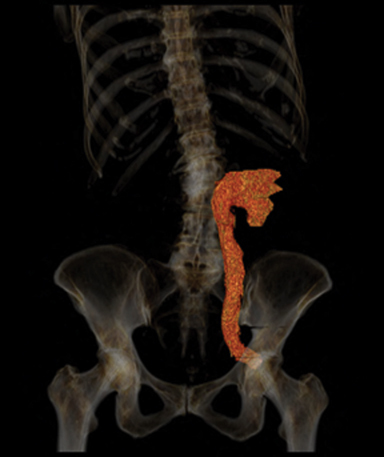 Noncontrast-enhanced CT demonstrated moderate left hydroureteronephrosis and left ureter coursing laterally into the sciatic notch ventral to neurovascular structures with an abrupt change in caliber suggesting impingement (Figures 1). CT three-dimensional reconstruction demonstrated the course of the ureter and its entrapment in the sciatic notch (Figure 3). Retrograde pyelography demonstrated horizontally redundant ureter in the sciatic notch (Figure 2). Sciatic hernias are a very rare type of pelvic floor hernia. Ureterosciatic herniation should be in the differential when the patient presents with the acute onset nausea/vomiting, colicky flank pain, abdominal pain, and reduced renal function. CT imaging with or without contrast confirms the diagnosis by demonstrating the ureter in the greater sciatic foramen posterolateral to the ischial spine and anterior to the piriformis. Pyelography demonstrating the “curlicue” sign is pathognomonic. This patient had resolution of symptoms and acute renal failure after ureter displacement from the greater sciatic foramen and double-J stent placement. Losanoff JE, Basson MD, Gruber SA, et al. Sciatic hernia: a comprehensive review of the world literature (1900-2008). Am J Surg. 2010; 199:52–59. Pollack HM, Popky GL, Blumberg ML. Hernias of the ureter: An anatomic roentgenographic study. Radiology. 1975; 117: 275-281. Beck WC, Baurys W, Brochu J, et al. Herniation of the ureter into the sciatic foramen (“curlicue ureter”). J Am Med Assoc. 1952:149: 441–442. Loffroy R, Bry J, Guiu B, et al. 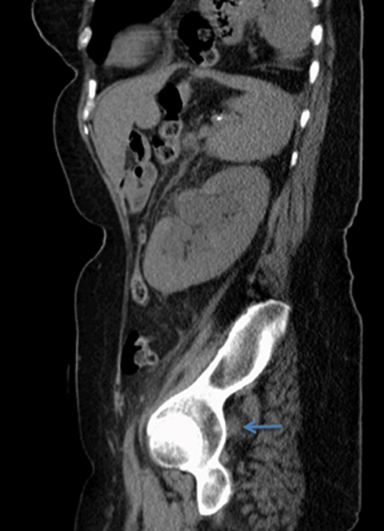 Ureterosciatic hernia: A rare cause of ureteral obstruction visualized by multislice helical computed tomography. Urology. 2007; 69:385.e1-3. Singh I, Patel B, Hemal AK. Robotic repair of a rare case of symptomatic “Ureterosciatic Hernia”. Indian J Urol. 2013; 29:136-138. Spring DB, Vandeman F, Watson RA. Computed tomographic demonstration of ureterosciatic hernia. AJR Am J Roentgenol. 1983; 141:579-580. Sylvestre D, Cail K, Brown AS, Greene W, Allen R. Ureterosciatic hernia. Appl Radiol. 2019;48(1):42-44. Prepared by Ms. Sylvestre while a third-year Medical Student at Mercer University School of Medicine, Savannah, GA; and Dr. Cail while a second-year Radiology Resident, Dr. Brown while a third-year Radiology Resident; and Dr. Greene and Dr. Allen while Radiology Attending Physicians, at Memorial Health University Medical Center, Savannah, GA.